Already with the selfies and cute girls. Oy. 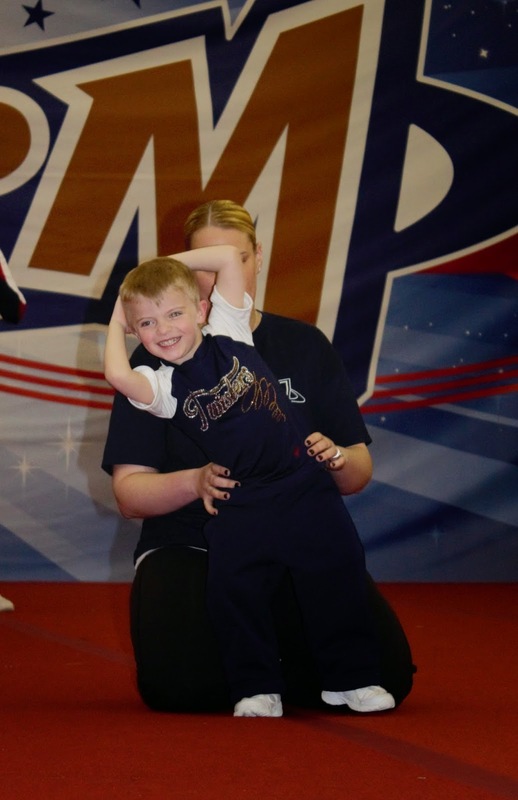 ...PJ's last cheer performance for the season was this past Saturday! This was such an amazing experience for us, and it was a little sad watching the season come to an end. It will be no fun to spend our Friday nights doing anything else but heading to the gym for practice, despite the horrible traffic on the way there! PJ learned and grew and loved so much, and I will be endlessly thankful for this unusual opportunity for my son. I mean, seriously. This kid is a super star! ...Sunday, of course, was Easter, and Pete and I filled a small basket of goodies (and a large chocolate bunny on the side) for PJ the night before. A little candy, a few trains, and a few eggs hidden about the living room made for a smiley boy on Easter morning. I know. We are so not religious. PJ is an excellent eater, so a few days a year of nonsense don't really phase me. This attitude resulted in PJ having copious amounts of chocolate, my living room littered with pastel foil wrappers. Pete and I let him go to town on a giant, now deaf, chocolate bunny. The kids enjoyed the Annual Cousin Easter Egg Hunt. PJ's method of hunting for eggs was to step on each plastic shell, pluck out the candy, and leave the open egg on the ground, the nerd. What a nerd! And now, Easter 2014 is in the bag. It was a loud, full, fun, beautiful day! ...it has been a bit of an emotional week, and I am looking forward to a fun, busy weekend of soccer, Sesame Place, and celebrating Pete's birthday with friends, fun, and delicious food! The weather is getting warmer, buds are blooming on the trees, and the air has that amazing feeling of the new season. That feeling in the air, I love it. I sniff it often. I love the cousins photo, but the bunny stare down is better. Not as good as the selfie with the cute girl pic though.